Rockstar today have announced a new release window for their ever delayed sequel Max Payne 3. The game is supposed to now be launching in the fiscal window of March 2012, meaning this will leave plenty of time for the final finishing touches and polish to be applied to the game before its eventual release. It also appears that the image above will be the games final box art when the game finally releases. As Rockstar like to have an artistic flair to all of their pack shots of their games. Sam Houser, the founding member of Rockstar had this to say about the game Max Payne 3 gave us an amazing creative opportunity to evolve one of our most iconic characters, We're excited to show fans a modern version of Max that pulls them back into his dark and twisted story. 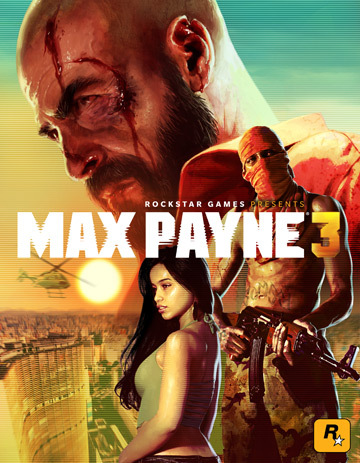 The story with Max Payne 3 is that Max is now trying to make himself a new life by working for a security firm in San Paulo in brazil, but unfortunately when the family that Max is hired to watch over gets targeted by violent gangs, its left to Max to clean up the mess and save the day so to speak. Max Payne 3 also comes with an all new multiplayer component not seen in other Rockstar titles, thus being able to change around and alter pre set maps whilst also being able to change progression for other players, this concept seems really intriguing. So with all these new details, will you be picking up the game when it drops next year?